Welcome to the Inn Between! I am Joreth Innkeeper d'Squiggle, the creator of this establishment. We have many different rooms in which our patrons may choose to spend their time. These rooms are all a bit different, as we have many different kinds of visitors. Please, wander around the Inn and choose a room to your liking. Before you do, allow your humble host to explain the rules of the Inn. To the left, you will see the portals that lead into the different rooms of the Inn. Simply click on the name of a room, and you will be transported to that room. To the right are the sponsors of the Inn and clicking on one of them will open a new portal to that realm. Patronizing these sponsors helps keep the InnBetween open. Anytime you wish to return to this main page of the Inn Between, just ask! 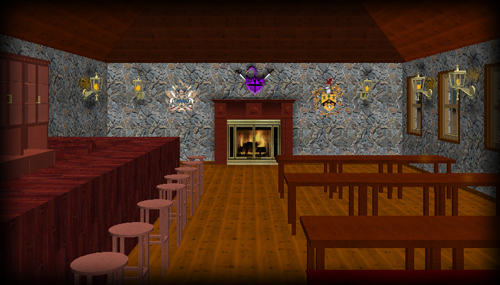 Click on the Dragonshield at the top-left and you will be transported back to the Common Room of the Inn Between. Please remember, all words and images of the Inn Between are copyrighted. Please do not steal what has been created with great effort by yours truly. If you wish to copy words or images found at the Inn, please ask me first. I usually grant these requests with correct attribution, but permission is still necessary to adhere to copyright laws. Remember, all words and images everywhere are automatically copyrighted the instant they exist, according to US copyright law, no copyright notice or stamp necessary. Downloading, using, or sharing images without permission is a copyright violation by default and saying "no copyright intended" does not absolve the copyright violation. The Inn Between is a realm created by and for adults. Some of what ye may witness here may be considered objectionable and by visiting any of its rooms, ye agree that ye be of legal age to view adult materials in your realm. Within this Inn, you can find tales of polyamory, skepticism, atheism, school bus conversions (also known as skoolies), photography, costumes, cosplay, and more!